As I age I realize that as a young adult, I was unaware of the impermanency of relationships and people. We take for granted that those we love will always be with us, and suddenly they are not. We carry their memories in our hearts and minds and although these people may fade from the public eye (if in fact they were ever part of it) within us we carry the key of remembrance. As I watch the world move on, I am struck by the fact that miraculous individuals are harder and harder to find. Those old, wise teachers of our time are disappearing, replaced by a void, by people who are less than majestic, very few can fill their shoes. This is a testimony to one of the greatest men I have had the pleasure of working with. I consider the Reverend William Brown to be my mentor and friend and I owe him a great debt for confirming to me that the world is unreservedly mysterious, amazing and multi-dimensional. I have met and worked with a true ‘teacher’ and for that I have been given a great gift. I only hope I can honour him correctly. Bill, as I called him, has disappeared off the map of time. He is not to be found on the internet, all the books written about him (over 13) are out of print; no-one mentions him anywhere. I find this to be strange considering he spent his entire life unreservedly in the dedication of service to humanity. And although he used to mutter to me that he didn’t want to be remembered, he was also keen on not having his work come to naught. Bill was one of those guys who communicated on many levels at once, moving me to a division and leap in consciousness to such a degree that I had to sleep immediately after a long session with him. The math, the maps, the etheric, astral, metaphysical, physics and harmonic information all compacted into one great allegory or spiritual/scientific equation after another, an amazing teacher and human being with a sharp wit and caustic sense of humour. Here is a biography of this amazing man as provided to me by Maria Brown. Many thanks to Maria as well, for her unceasing intent and blessing, for helping me and supporting my attempts to document Bill back when both of them were living. And although none of our plans worked out, I haven’t forgotten your trust in me, your intense dedication to life and overall humanitarian goals. 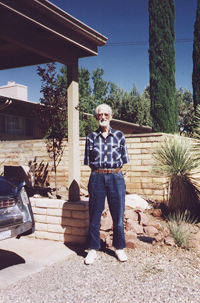 William C. Brown was a researcher, a healing practitioner, and an ordained non-sectarian minister involved in the use of ‘New Energy’ for over thirty years. As the original American etheric surgeon and the first pioneer in the field he created the term ‘etheric surgery’ in 1954 to describe his new branch of healing arts. A ‘sensitive’ since the age of three, he was gifted and highly trained in extra-sensory perception; clairvoyance, clairaudience, psychometry and the ability to read the Akashic Records with personal interests in cosmic law and philosophy. He was personally auditioned by Igor Stravinsky in his twenties and as a result he was awarded a scholarship to the New England Conservatory of Music in Boston. In World War II, he served in the Merchant Marine and became an experienced pilot with over 15,000 hours in the air. He authored the original Treatise on Etheric Surgery and established many charts and formulas relating to the etheric body and its energies. Bill researched and wrote papers pertaining to harmonics as a solution to the effects of ELF (extremely low frequency) waves on mental and physical health. He researched and wrote in the area of Healing through Harmonics, Mitigation of Radioactivity, and Etheric Surgery. Etheric surgery is the bloodless correction of physical problems by specifically working on the etheric body which is the primary source or cause point of physical conditions. (Etheric surgery does not correct chemical, psychological, or emotional imbalance. Chakra opening, aura balancing, laying-on-of-hands, absent healing, use of crystals, light and colour, psychic surgery and other methods of healing are not to be confused with the specific science and discipline of etheric surgery.) The beneficial results of Bill’s etheric healing work, assisted by his wife Maria, were known worldwide and were documented by thousands of healings in 57 different countries. Through his lectures, papers, and educational projects, etheric healing techniques were introduced to outstanding health professionals. He was enthusiastically supported by Joseph Chilton Pearce, Peter Caddy, Drs. C. Normal Shealy, T.S. Friedman, Eugene Jussek, and Brugh Joy. Here is an account from a person who had ‘etheric surgery’ with William Brown when he worked with his first wife Nancy; start at page 97, and here is another, page 184. His second wife Maria Nicolosi-Brown, who had an extensive background in healing and metaphysics, was the daughter of the internationally known sculptor, Joseph Nicolosi who was associated with the A.A. Bailey and Arcane School. Her mentors were Lady Forbes, Dr. Roberto Assagiolli, Dane Rudhyar, John Bennett, Ibu Subuh and the leaders of the Vedanta and Theosophical Societies. Educated at the Waldorf School, the Sorbonne, Gadjahmadh University in Jakarta, Finch College and UCLA, Maria was a researcher and author of articles on alternative healing, history, art symbolism, and Asian culture. She demonstrated Yoga in the first published books and on the first TV show about yoga in the US. In 1982 Bill interrupted his etheric surgery practice, and with the help of Maria, began to research why the once long lasting positive effects of his etheric surgery were losing their permanency. Working as a team the Browns were altered by other etheric surgeons that the interruptions to the etheric surgeries were due to electropollution. This was supported by their own research and by the discovery that electropollution had disastrous effects on human health. They needed to find an effective shield to the effects of harmful electromagnetic radiation and ELF waves. They expanded their research to include the effects of other waves such as alpha, beta, gamma, x-rays, and microwaves and their radioactive radiations and mutations. As a result of their research and testing regarding the mitigation of harmful electromagnetic radiation, the establishment of a Science of Harmonics, and for Brown’s work with etheric energy, they were awarded a grant from the Fetzer Foundation to write three reports on the subject. Bill’s work eventually culminated in his inventing what Dr. William Tiller of Stanford University christened “The Brown “E” Field Generator” (E stands for energy). Bill’s advanced knowledge made him sought after by many people in the forefront of the EMR and ELF research, including; Robert Beck, William Tiller, Tom Bearden, and Andrija Puharic. CNN did a half-hour documentary on the use of radio wave weaponry which was based on the Brown’s research on the effects of electromagnetic fields. They were interviewed extensively for this documentary of which CNN reported the largest viewer response ever from any show at the time. They founded the Beacon Light Center in Georgia in 1954, which was later incorporated (1975) and federally approved as a non-profit educational corporation in Sedona, Arizona. The purpose of the BLC was to better document and define; etheric surgery as a science, the mitigating effects of the Brown E Field Generator, and to educate the public regarding the dehabilitating effects of EMR and ELF waves as well as to instigate a training program in response to requests from qualified health professionals. The BLC was intended to also support work on the mitigation of radio-activity and investigate the electric properties of disease, in that by using electromagnetic fields, disease can be cured. They intended to build a bridge between the realms of metaphysical and physical science and to educate humanity on the use of advanced health, energy, and environmental technologies and by this to be of service to humanity, the planet, and the microcosm of life therein. Bill was respected and supported by an amazing group of people; he worked with many ‘A’ list celebrities of his time as well as prominent religious, political and scientific persons. An inseparable pair, both Bill and Maria are deceased. Following in his footsteps, my alter-ego, BoRacque, wrote an essay about the negative etheric effects of mobile phone use. Insidious Trap – Mobile Phone Addiction, Obsession and Psi. A new book has come to light with a chapter about Bill Brown’s etheric surgery. In Chapter 9 a detailed description of his etheric surgery methods and their ultimate positive change in the author’s condition, verified by doctors and X-rays. There is a chapter on Bill in David St. Clair’s book ‘Psychic Healers’. If you have been a friend of Bill’s or have any experiences you would like to share about him, please contact me as I hope to document more of his life in the near future. All queries will be kept confidential due to the nature of his work. Thank you to those who have contacted me already, your information has been valuable. You might find this article by ‘Alexander Dumont – 1985′ interesting.